Pocket PC to Mobile SMS Software send text message to all GSM and CDMA mobile phone from windows based Pocket PC mobile devices. Software allow user to send group SMS to either single or multiple people without requiring any internet connection. User can easily keep in touch with his relatives, family members, friends and office employees etc at any part of the world. Simple and reliable Bulk text messaging software provides integrated solution to establish better communication with customers. 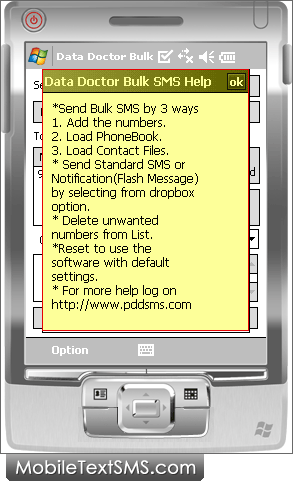 PDA to Mobile SMS utility have the capability to send bulk messages and even saves the entire details of text messages for future reference. Mobile text messaging software support all major Pocket PC devices including Palm Treo Pro, Samsung Epix, HTC Touch HD, Orange SPV C550 Smartphone, Motorola MPx200, Motorola MPx220, Hitachi Pocket PC phone, Anextek SP230 and other popular brands. Pocket PC to Mobile SMS Software send group SMS from Pocket PC to mobile phone on both national and international mobile networks. Software is a communication service provider that can be useful for business marketing to send job alert notification, promotional or marketing campaign, share market information etc. Pocket PC to Mobile message utility facilitates user to enter recipient contact number manually, loads from any contact files or import from any phone book entries. Bulk SMS software runs on Windows based operating system and does not require any external connected device to send the SMS.